GNS Science has asked for public help in finding three ocean bottom seismometers, on loan from Japan, which failed to surface when they tried to pick them up from the seafloor two months ago. The three instruments that have been recording seismic waves from earthquakes and other sources did not respond when scientists sent an acoustic signal to them from a ship during the recovery voyage in March. Of the 100 deployed on the seafloor east of Gisborne late last year, 97 were successfully recovered. 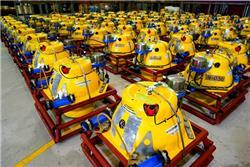 The instruments have been used to collect a CAT-scan-like image of the tectonic plates deep under the East Coast. The bright yellow spherical instruments, about the size of a large beach ball, might float to the surface of their own accord and wash up anywhere along the Tairawhiti Coast. They carry the markings, GNS Science (NZ) plus some Japanese characters. “The instruments are valuable and we would like to return them to our Japanese colleagues who kindly loaned them to us for the duration of the project,” said leader of the New Zealand team Stuart Henrys, a geophysicist at GNS Science. The scientists ask anyone finding an unusual piece of equipment such as this to contact GNS Science at 04-570-1444. GNS Science will organise collection and cover the cost freight. The international project that will continue until October, has involved deployment of several hundred onshore and offshore seismic instruments to record seismic waves from earthquakes and from ships that generate pulses of sound directed at the seafloor. Data collected by the onshore and offshore instruments is combined and helps scientists create a 3D image of the subduction zone down to a depth of about 15 kilometres below the surface. “This gives scientists an insight into the properties of the rocks on either side of the plate boundary,” Dr Henrys said. The Hikurangi plate boundary, a huge geological feature below the seafloor east of Gisborne, is where the Pacific tectonic plate dives beneath the Australian plate. Dr Henrys said the focus of the research project will help to understand how, why, and how often the Hikurangi plate boundary fault moves in large earthquakes. “The Gisborne region is an ideal natural laboratory to study how plate boundary faults behave,” he said. Rebecca Bell, a geophysicist at Imperial College London and lead UK scientist on the project, said the dense deployment of seismographs on land and on the seafloor was a world first for the science community and provided an opportunity to develop images of unprecedented quality and resolution. Dr Bell said most of the 200 land-based instruments had been recovered, but 50 seismographs would remain in place until October to record additional earthquakes. The 3D research project is funded by the National Science Foundation in the United States and the Natural Environment Research Council in Britain. The NZ involvement is supported by the Ministry of Business Innovation and Employment (MBIE) Endeavour Fund and funding from GNS Science. The Ocean Bottom Seismographs come from Japanese marine science agency JAMSTEC. An ocean bottom seismograph being recovered from the seafloor east of Gisborne in March. 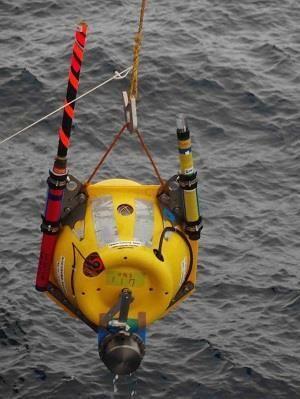 The yellow plastic housing contains a sealed buoyant glass sphere and scientific instruments. Attached strobe light and antenna help locate the instrument when it floats to surface.